This document is a technical summary of the Federal Highway Administration report, Impact of Design Features on Pavement Response and Performance in Rehabilitated Flexible and Rigid Pavements (FHWA-HRT-10-066). The Long Term Pavement Performance (LTPP) program is a 20-year study of in-service pavements across North America. Its goal is to extend the life of highway pavements through various designs of new and rehabilitated pavement structures using different materials and under different loads, environments, subgrade soil, and maintenance practices. LTPP was established under the Strategic Highway Research Program and is now managed by the Federal Highway Administration. Several studies have evaluated properties and performance of mixes with RAP in the laboratory that have been documented in literature. (3) When designed properly, RAP mixes have demonstrated a quality comparable to virgin HMAs. However, despite all the information available and the success rate of RAP mix projects, the perception that recycled materials are of inferior quality still persists. The objective of this TechBrief is to provide a summary of statistical analysis results of data collected during the Long-Term Pavement Performance (LTPP) program in which performance of recycled HMA was compared to virgin mix in flexible pavement overlays. The LTPP Specific Pavement Study (SPS)-5 experiment was designed to provide quality data for developing improved design methodologies and construction alternatives for flexible pavement rehabilitation. Techniques commonly used in the United States and Canada were applied to test sites in various geographical locations. Test sections in each site were subject to similar climatic, subgrade, pavement structure, and traffic conditions. The experimental factors included the surface condition prior to overlay, environment, and traffic loadings, as well as the different treatment alternatives. Mix type was one of the factorial variables in the experiment. Virgin and RAP mixes were used in combination with two other design features (surface preparation and overlay thickness) in 9 sections, including a control section, in each of the 18 sites selected for the experiment. The main purpose of this study was to compare general trends in performance and response associated with pavements rehabilitated with virgin and RAP mixes. In the initial phase, each site was evaluated individually to compare the performance of the test sections in the specific site. Repeated analysis of variance (ANOVA) tests were used for the comparisons by pairing distress measurements with survey dates. Surveys at each site were conducted in the same day for all nine sections. All sections within each site were subject to similar in situ conditions of traffic and climate. Therefore, the performance distribution over time was considered a repeated measure for each alternative treatment, and the trends, grouped by overlay mix type, were analyzed simultaneously for each site. The results of the statistical analysis were evaluated in two steps. The first step was to check if there were statistical differences. If confirmed, the second step was to identify which mix type had better performance and response to load applications. Performance was evaluated using load-associated distresses. Roughness, rutting, fatigue cracking, and response were evaluated by maximum deflections from falling weight deflectometer (FWD) tests. The analysis included short-term (less than or equal to 5 years) and long-term (longer than 5 years) performance. Figure 1 through figure 4 summarize the results of the statistical analysis for all sites. The bars on the right side of each plot represent the percentage of sites that presented no statistical difference in performance between the two mixes (RAP and virgin), and the bars on the left side of each plot show the percentage of sites where one mix type outperformed the other. Figure 1 indicates that there was no difference in smoothness in 11 (61 percent) of the 18 sites for the short term and 8 (44 percent) out of 18 sites for the long term. RAP outperformed virgin mixes in three sites (17 percent) and underperformed in seven sites (39 percent) in the long term. These results suggest that RAP and virgin mixture overlays had statistically equivalent performances in the majority of the sites evaluated. Figure 2 presents the results for rutting and indicates that there were no differences in rutting performance in 13 sites (72 percent) and 8 sites (44 percent) for the short-term and long-term performance, respectively. In four sites (22 percent), RAP outperformed virgin mixes, and, in six other sites, the opposite occurred. Virgin mixes outperformed RAP in the short term in five sites (28 percent). A slight advantage was observed in favor of virgin mixes when fatigue cracking was considered, as shown in figure 3. Although the majority of the sites had equivalent performance between both mixes, virgin HMA overlays had better performance compared to RAP mixes in most of the sites where significant differences were identified. There were no sites where RAP outperformed virgin mixes in the short term. In the long term, nine (50 percent) of the sites had virgin mix sections that performed better than RAP sections, compared to three sites where virgin mix sections did not perform better than RAP sections. Structural response was evaluated using the maximum deflection values from FWD survey tests. Figure 4 presents the results for maximum deflection. Although maximum deflection alone is not a measurement of stiffness and subgrade accounts for a significant proportion, they both can provide a useful comparison considering all of the measurements were taken under similar conditions along each site. The results in figure 4 suggest that RAP mix overlays could provide, at least qualitatively, structural improvement equivalent to that for virgin HMA. Figure 1. Graph. 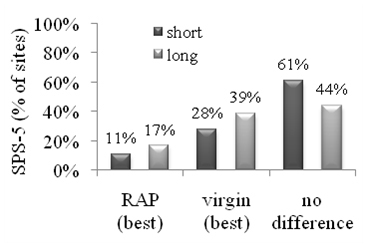 ANOVA results for SPS-5 experiment comparing roughness of RAP and virgin mixes. Figure 2. Graph. 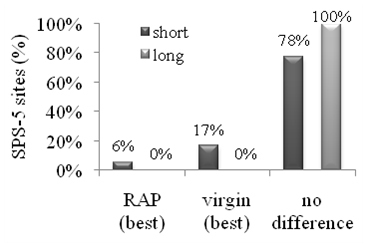 ANOVA results for SPS-5 experiment comparing rutting of RAP and virgin mixes. Figure 3. Graph. ANOVA results for SPS-5 experiment comparing fatigue cracking of RAP and virgin mixes. Figure 4. Graph. 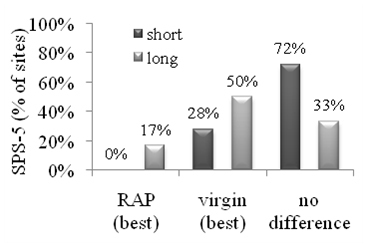 ANOVA results for SPS-5 experiment comparing maximum deflection of RAP and virgin mixes. The impact of overlay thickness on performance for both mix types was also investigated. The statistical summaries shown in figure 5 through figure 7 demonstrate that in the majority of the sites there was no statistical difference in performance when comparing RAP and virgin mixes if the overlay was thin ((1.99 inches (51 mm)) or thick ((4.95 inches (127 mm)). Virgin mixes performed better in a few more sites than the RAP mixes when the overlay was thin. However, this number decreased considerably when the overlay was thick, suggesting that the thicker the overlay, the higher the likelihood that RAP and virgin mixes perform alike. Figure 5. Graph. Cross evaluation of roughness performance between mix type and overlay thickness for SPS-5 sites. Figure 6. Graph. Cross evaluation of rutting performance between mix type and overlay thickness for SPS-5 sites. Figure 7. Graph. Cross evaluation of fatigue cracking performance between mix type and overlay thickness for SPS-5 sites. In recent years, there has been a significant increase in the use of RAP in HMA mixes promoted by the Federal Highway Administration and State transportation departments. This study contributes to the current knowledge base by statistically evaluating the performance of RAP and virgin mixes at individual sites and test sections subject to similar traffic and environmental conditions. Statistical results suggest that in the majority of cases RAP mix is statistically equivalent to virgin HMA mixes when comparing the performance indicators used in this study. Deflections were also statistically equivalent at all 18 monitored sites, suggesting that RAP overlays can provide structural improvement equivalent to virgin HMA overlays. 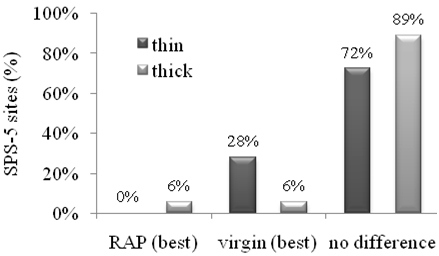 Overlay thickness influenced the outcome of the comparison between RAP and virgin mixes. The number of sites where no statistical difference was found increased when the sections were rehabilitated with thick overlays. This result suggests that when thick overlays are designed for pavement sections, the likelihood that the performance will be similar for both types of mixes increases. In summary, the performance data from LTPP SPS-5 shows that RAP and virgin HMA mixes used in overlays of flexible pavements showed approximately the same performance across a range of climates, traffic, and existing pavement conditions over a period of up to 17 years. This finding should give agencies confidence in specifying RAP mixtures for overlays when economic and other conditions warrant. Rehabilitation costs are also a critical factor when deciding which mixture type to use. Cost analysis is a critical step in the design of rehabilitation treatments. It is also important to note that these conclusions are based on the number of sites showing statistical differences between the two mixes evaluated with ANOVA tests. Moreover, these conclusions are valid for the analysis of load-associated distresses. It is also necessary to compare other types of distresses not evaluated in this analysis, particularly those associated with the durability of the pavement (e.g., raveling). Sullivan, J. (1996). Pavement Recycling Executive Summary and Report, FHWA Report No. SA-95-060, Federal Highway Administration, Washington, DC. Federal Highway Administration. FHWA Recycling Policy, Federal Highway Administration, Washington, DC. Obtained from: https://www.fhwa.dot.gov/pavement/recycling/index.cfm. Site last accessed June 1, 2009. McDaniel, R. and Anderson, R.M. (2001). Recommended Use of Reclaimed Asphalt Pavement in the Superpave Mix Design Method: Technicians Manual, NCHRP Report 452, Transportation Research Record, Washington, DC. Researchers—This study was performed by Applied Research Associates, Inc., Elkridge, MD. Availability—The publication from which this TechBrief was developed, Impact of Design Features on Pavement Response and Performance in Rehabilitated Flexible and Rigid Pavements (FHWA- HRT-10-066), is available from FHWA Product Distribution Center. Key Words—Flexible pavement performance, Pavement rehabilitation, Recycled mix, Overlay, LTPP data, Data analysis, SPS, and RAP.